The BID cultivates and advocates the economic growth of downtown Troy by creating an inviting, dynamic, and sustainable community that celebrates the city’s history while building towards its future. The BID is dedicated to improving the quality of life within the district to further enhance and make our community a vibrant, attractive destination for visitors, businesses, residents, property owners, the daily workforce, and students. The Downtown Troy BID has four main areas of focus including marketing, business development and retention, public services and beautification, and family friendly special events. Each area of focus has a special committee open to the public which meets monthly. The Downtown Troy BID offers many programs to retain and attract businesses to the city. We encourage you to network with like-minded entrepreneurs, learn something new, and engage with your community. Annual events include the bi-monthly Meet & Greets and educational programs for small businesses, the biannual For Rent event (May + October), annual Discover Troy event (May). Looking for support to start a new business or relocate to downtown Troy? We can help you find the perfect location, connect with resources and valuable community members, and even arrange your ribbon cutting and grand opening press. Downtown Troy attracts thousands of visitors to the district each year through marketing and advertising campaigns reaching new audiences every day. Targeted marketing with the Shop . Dine . Explore campaign is utilized throughout the year with ads on billboards, through print news, magazine ads and articles, digital ads, and local press coverage. 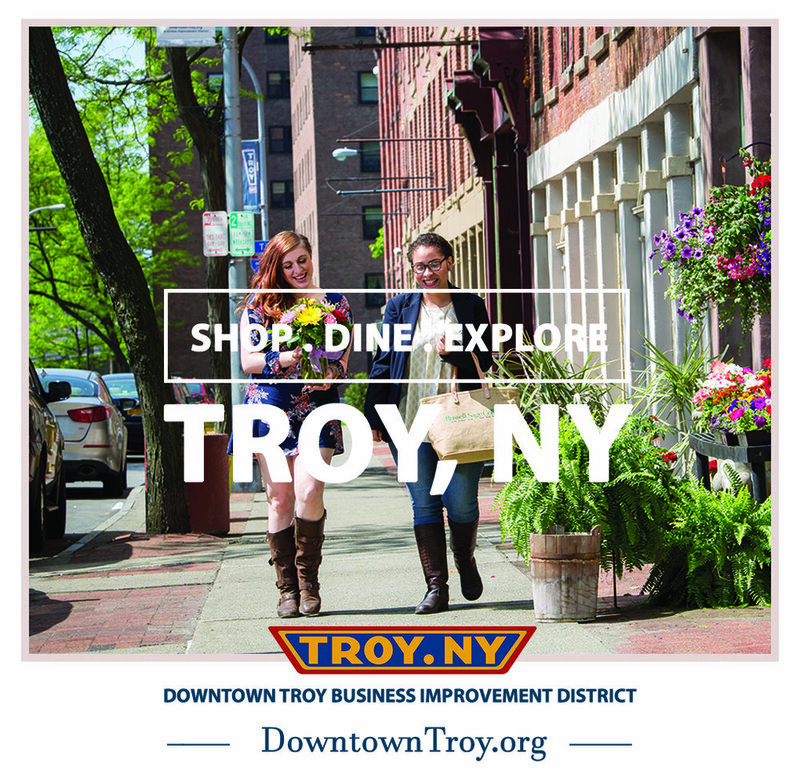 The Downtown Troy BID also markets the district through the creation of walking guides (20,000 copies printed annually), directional signage, printed materials, through a bimonthly e-newsletters, Troy Night Out events, member listings, an online presence at DowntownTroy.org, and use of social media platforms. LOOKING TO REACH NEW AUDIENCES? Do you have an upcoming event? Running a promotion? Engaging with your staff? Hiring someone new? Tell us about it! We love to share your news on our social media platforms and in the Downtown Happenings newsletter sent bi-weekly. Get on our mailing list here! The Downtown Troy BID focuses daily on our surroundings and has a dedicated cleaning staff. We plant, water and maintain seasonal plantings, arrange district wide cleaning activities, display seasonal decorations, and pay close attention to lighting, tree cover, safety hazards and more! Make sure to say hi to our street cleaning team. We also have a beautification committee that keeps track of issues such as graffiti, lighting, walking hazards, attractiveness and appeal of the district, manages beautification fundraisers and facilitates public art. They play a huge role in keeping our city looking GREAT! Special events are a wonderful way to engage new audiences and provide activities for families, friends, and loved ones to enjoy the city. Discover new and exciting shops, restaurants and services by walking the streets and exploring along the way! Guests enjoy live music, vendors, fitness, food, and more through a wide range of free events & programs hosted by The Downtown Troy BID. Troy Night Out, Free Fitness in the Park, Restaurant & Craft Beer Week, the Troy Makers Market, Troy River Fest, Rockin' on the River, Troy Pig Out, Troy Chowderfest, and the Collar City Kilt Fest are some of our most popular held throughout the year. Each of these events bring thousands of visitors and residents to the streets of Downtown Troy. 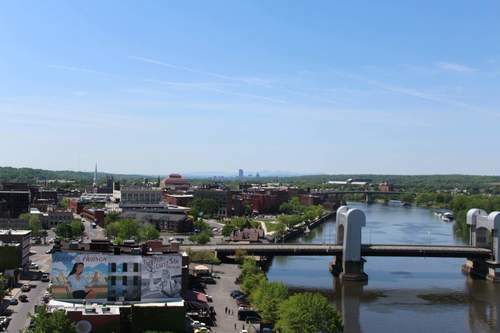 These events aim to raise the quality of life for those living and enjoying downtown Troy, while raising funds to support the initiatives of the Downtown Troy BID. Properties comprising the Troy BID include all vacant parcels and properties in commercial use, and residential properties that are comprised of three or more dwelling units, whether or not they are owner-occupied. Tenants of Commercial Property are considered Class B members. Tenants, who are an individual, sold proprietorship, partnership, corporation, limited liability company or limited liability partnership, and who are occupants pursuant to leases of commercial space within the Central Business District. HOW IS THE DOWNTOWN TROY BID FUNDED? The Downtown Troy BID is partially funded through the tax assessment which the City of Troy collects on behalf of the Downtown Troy BID. This tax applies to commercial buildings located in the central business district which pay taxes, and averages approx. $100,000 annually. The tax assessment is leveraged through sponsorship and special events to round out the budget each year making up an additional $400,000 annually. The purpose of a BID is to improve business conditions in a specific area, attract and retain businesses, generate jobs and improve the quality of life for those who use the district. A BID enables stakeholders to decide which services to provide to meet the district's unique needs. A BID is a special district created by a local municipality to focus on promoting business activity and furthering the revitalization in a downtown or commercial area. A BID is a specific geographic area in which a variety of improvement activities and services are undertaken. A BID is managed by a district management association, which is incorporated under the state not-for-profit law. Its board of directors is made up of property owners and tenants within the BID, with a majority of the board being comprised of property owners from the district. View the BID organizational plan here. WHAT SPECIFIC SERVICES CAN A BID PROVIDE? The BID's services are meant to enhance and complement the services already provided by the City of Troy.